She faked her death to escape life as an assassin. But now her enemies have tracked her down, and this time they want her to stay dead. Nick Dade is a hired gunman, the best of the best. He's read Anya's file inside-out and, after weeks of surveillance, he's ready to pull the trigger...until someone else beats him to the punch. With his agenda shattered, Nick suddenly finds himself thrown together with the woman he's been sent to eliminate. Who is she really? Who hired the second hit? And who can he trust? Together Nick and Anna find themselves embroiled in a web of deceit and desire as an unknown enemy - one with dangerous ties to Anna's former life, and a present-day political assassination - closes in. To unravel the truth, Anna must face her past even if that means risking both Dade's life and her own...for good this time. I got an advance copy of this story to review and boy am I ever glad! I have been a huge Gemma Halliday fan since I picked up the very first book in the High Heels Mystery series. So when I had the chance to read her latest, I jumped at it. 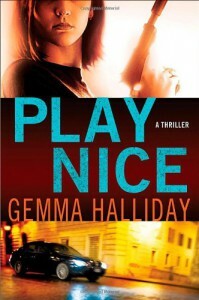 A total departure from the zany, friend-centric stories in the High Heels series, Play Nice is a non-stop thrill ride from page one. The story of an assasin trying to leave her former life behind is full of twists and turns that kept me on the edge of my seat the entire time. This book was really high voltage and I found myself reading faster and faster, both in an effort to keep up with the super fast action and to find out what was going to happen next. Of course, you can not write a review about this book and not mention the explosive chemistry between Anna and Nick. The sparks fly fast and furious with these two. All this despite the fact that he was sent to kill her and she will do anything to get away.I am trying really hard to be careful what I say so as not to give anything away. When I got done reading this story, I felt as though I had run a marathon. The fast pace and plot twists left me feeling mentally exhausted and satisfied all at the same time. This story was fantastic and I can not wait to see what happens next in this series! I can't say it any stronger than this: Go buy the book. Now. I see you still sitting there. Get going! It is seriously worth it.